Never been a fan or supporter of ‘revisionist history’. The questioning or revising of know historical events for the purpose of reputing or supporting one’s own views or philosophies can be a very dangerous affair. But if history revisions can be executed as well as the retelling of ‘Little Red Riding Hood ‘ in the Weinstein companies 3D animated ‘Hoodwinked’ then revise away! We all know the story. Red is minding her own business, trying to get some hot biscuits to her old decrepit Granny while being harassed by a mean angry insensitive wolf, who would have eaten her too had it not been for the brave woodsman who saved day. But that’s not quite the whole story it appears. The movie begins at that point with Red, voiced by The Princess Diaries Ann Hathaway, Granny, Voiced by the legendary Glenn Close, the wolf and the woodsman all handcuffed while our Grizzly Bear police chief, performed by hip-hop star Xzibit, sorts everything out. The REAL mystery it seems is that some scurrilous creature is stealing all of the woodland goodie recipes, driving a lot of hard working forest animals out of business. Granny’s recipes are the only one’s not yet purloined and all the evidence points to the Wolf, voiced with witty precision by the Tick’s Patrick Wharburton. But not so fast my friend, there’s more to this than meets the eye and that leaves super sleuth Nicky Flippers the Frog, as voiced by David Ogden Stiers, to unravel this ball of twine. the four different timelines fall in and around each other was often very cleverly done and always entertaining. One of the things that make the best animated films work is the ability to entertain both children and adults alike, Finding Nemo, The Lion King, and The Incredibles come to mind as the best of the genre. Often, animated films are too adult oriented in humor to entertain the children, i.e., Sharks Tale, or too infantile to keep the Grups from falling asleep such as the awful Home on the Range or the not much better Valiant. Hoodwinked possessed enough Saturday morning style cartoon humor one would expect from furry bunnies, silly squirrels and the like to the kiddies quite entertained, and a load of witty, snappy dialog and clever gags to keep their parents entertained as well. A standout performance of note is Japeth the singing Goat performed by Benjy Gaither of the Gaither Christian group who will have you rolling in the aisles as he sings about his horns and the earnest of being prepared. And if you don’t laugh then you have a problem. Seriously. I’m not joking. Get help. Along those lines, there’s quite a bit of original music dispersed throughout the movie, some better than others, including possibly the worst movie song I’ve ever heard, ‘Red is Blue’. Other than that horrible song, a mystery that’s not really much of one, and it getting really silly in the end, Hoodwinked is good eighty minutes well spent. Maybe not the most cutting edge animation ever seen on the screen, but a welcome respite from the Chicken Little’s and Valiant’s we’ve been subjected to as of late. Revisionist history. Maybe it’s time to rethink that whole lunar landing thing. 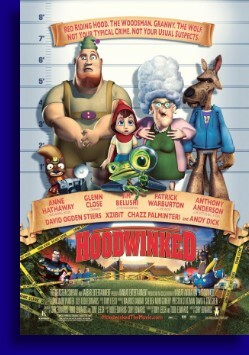 Buds Second Opinion: Hoodwinked is solid, good, family entertainment. The kids will really like it: the movie is built around a familiar story, with characters that kids will be able to identify with. But those characters have been brought-forward to the 2000's in interesting ways, and the new characters that get mixed in really make the story seem more fresh than you would probably expect. And add in the right amount of zany whack-a-mole antics, and you end up with a movie that the kids will like, and will pay attention to.